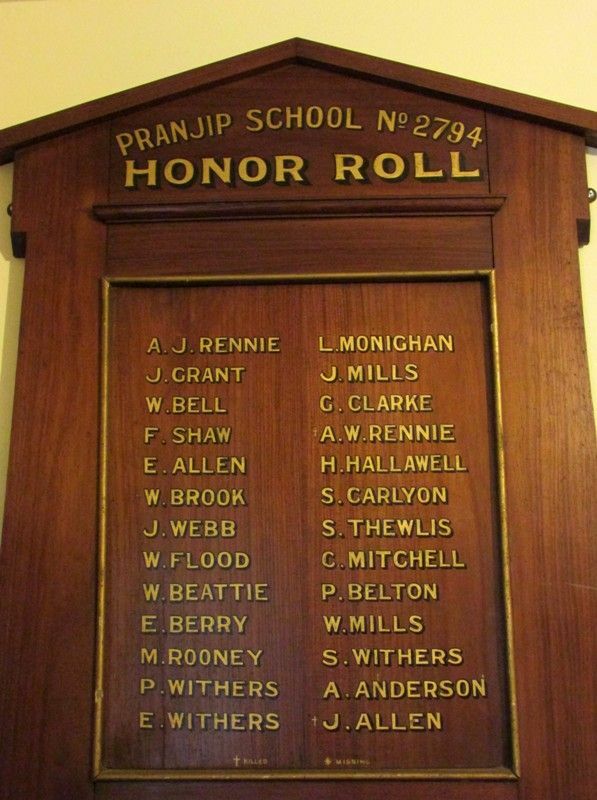 Pranjip School Honour Roll commemorates those who served in World War One. The unveiling of the honor roll in connection with the Pranjip school took place on Wednesday and was very well attended, Cr E. Brodie, J.P., presiding. Mr John Gordon, M.L.A., who was warmly applauded, expressed his pleasure at being present and said those who had gone forth to fight for the Empire were undoubtedly worthy men, but seeing the fine old pioneer stock from whioh they had sprung, it is not surprising they answered the call. Mr Gordon then unveiled the honor roll, which was neatly designed in Australian blackwood. The Rev H. M. Warry also spoke. The National Anthem was sung and three cheers given for the boys at the front. Euroa Gazette (Vic), 16 October 1917.